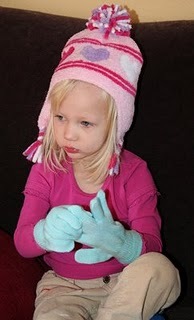 At one point in the afternoon yesterday, Juliana was being very quiet. This is usually cause for concern. 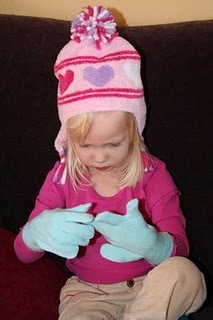 However, when I rounded the corner I found her wearing her winter hat and one glove and intently focused on getting the second glove on. 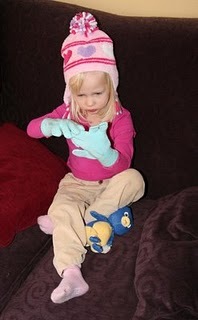 Soon after I took these pictures, I came back to find that she had added her snow boots to the ensemble. She wandered around the house this way for a while and then discarded the boots in favor of mine and then scattered all of the accessories around the downstairs.